My great-grandfather made pies. Always the same ones, sticky sweet pecan and tart lemon meringue. It has taken a long time for me to come around to nuts being ok at all, then I'd begrudgingly eat the pecans because they were surrounded by the sugar, butter, vanilla goo and flaky flaky pie crust. The lemon meringue was always piled high with a dry, foamy meringue that would be the reason I'd avoid anything with so much as the hint of meringue for years - until I went to culinary school, in fact. I'm sure it was the style to make that sort of meringue and it definitely looked impressive but it really has nothing on a silky smooth proper french meringue. I'd scrape it off and eagerly devour the smooth lemon filling. His garage was always filled with jars of apricot jam and jalapeno jelly, made each Summer and sealed with a thick layer of paraffin. Visits at the end of Summer always guaranteed a batch of fresh apricot ice cream and trip to Marine World Africa USA. 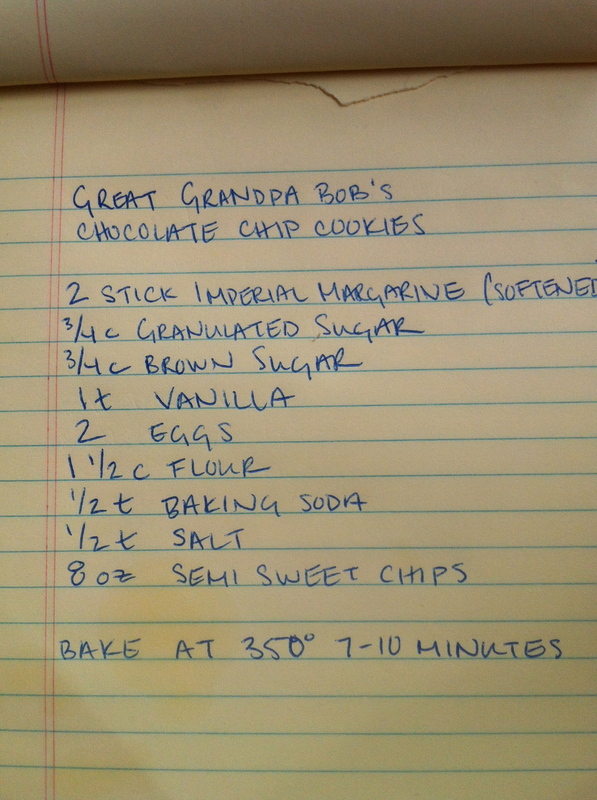 But my favorite, my absolute favorite thing to make with him was chocolate chip cookies. I don't know how old I was when we made our first batch together, not very. I often say I've been perfecting my chocolate chip cookies for the past twenty-four years and I don't think it's an exaggeration. It always started the same, two stick of Imperial margarine (he was nothing if not frugal) into the microwave to soften and then into the glass bowl of the Sunbeam stand mixer. Then three-quarters of a cup of white sugar, back and forth with the back of a butter knife, one, two, three times until perfectly level. Next came my favorite, three quarter cups of tightly packed brown sugar that came out in little mounds like sand castles into the mixing bowl. I stood on the avocado green step stool required to reach the counter and eagerly watched the beaters turn the "butter" and sugar into one light and fluffy mass. Next the mixer would be turned off (not by me, because I had to promise to keep my small hands away from those quickly spinning metal finger breakers) and I'd get to crack two eggs in the bowl and carefully measure a teaspoon of vanilla before it went back on. Dries were measured the same as the sugar - leveled with exactly as much precision as you would expect a Naval chemist to require. After the dries, I'd get to open and pour in the yellow bag of Nestle semi sweet chips. Then it was time to remove and lick the beaters. We'd use two spoons to carefully form and space out mounds on the cookie sheets that I was under no circumstance supposed to put in the oven. While the cookies were baking the kitchen table would be covered in a double layer of newspaper for the cookies to be carefully moved onto to cool. I don't think I even knew cooling racks were a thing until I was a teenager. And when they were cool enough to touch but still warm enough to be gooey, it was time to eat them. 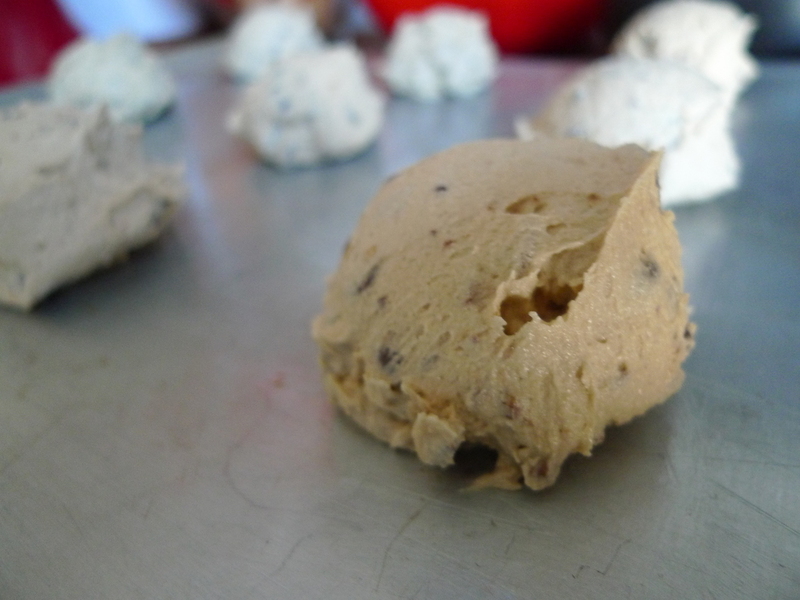 In high school I made so many batches of chocolate chip cookies that we'd go through a handmixer every few months. I didn't even eat that many, it was just the process, the familiarity of the ritual of measuring and mixing that would calm and de-stress me. I'd come to class with giant bags of cookies and hand them out. They're still the thing my friends and family request the most and made up most of the care package I sent to Lara when I found out her father was dying. 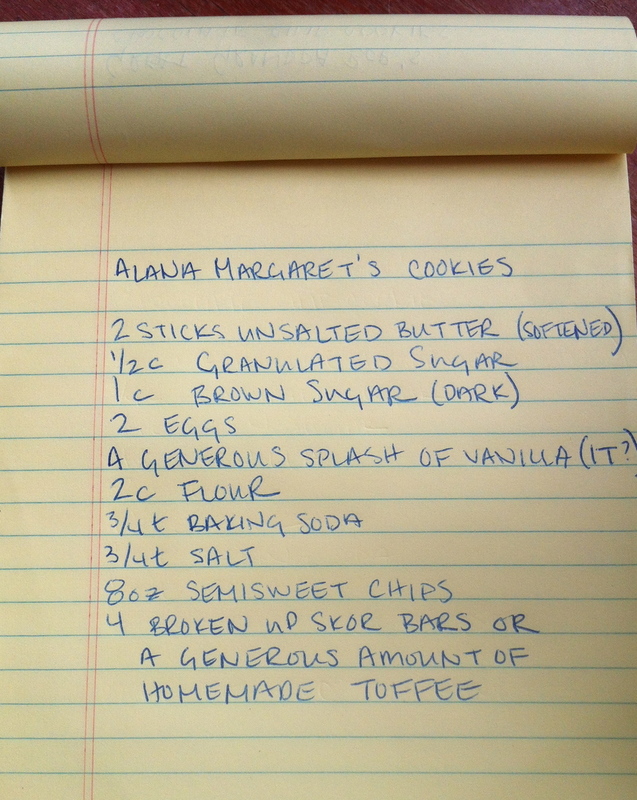 I have slightly different recipes depending on who is requesting them. I know how to make them thin and crispy, like my great grandfather's, for my grandma (though she really just wants the dough, sans chocolate chips, anyways), I know how to make thicker, soft ones that are somewhere near the platonic ideal and I know the recipe for my own preference, the toffee studded ones that are most requested. And each time I make them, I think of my great grandfather's neat preciseness, his three strand comb over and Ford belt buckle, the house in Vallejo, the pink bedroom and the apricot tree in the backyard. I think he probably didn't know that he was teaching me something that would comfort me for the rest of my life, that would become my career and I wish he were still around to tell. I'm participating in The Scintilla Project, a fortnight of storytelling. This post was in response to the prompt "Many of our fondest memories are associated with food. Describe a memorable experience that took place while preparing or eating food."